In the last two articles from this series, we’ve discussed pretty big companies. We’ve already talked about Apple, Netflix and Uber. We’ve touched on Verizon, Comcast and Amazon. But can we go even bigger than that? Today, I’d like to give it a try and discuss Facebook and Google customer service. Both Facebook and Google have huge number of customers/users. As you might imagine, they need to have a robust customer service to handle all the calls for help. We’ll go over Facebook and Google customer service, discuss the kind of help they offer and show why it works. You don’t have to go to the Facebook customer service page to guess whether they are offering real-time customer service or not. 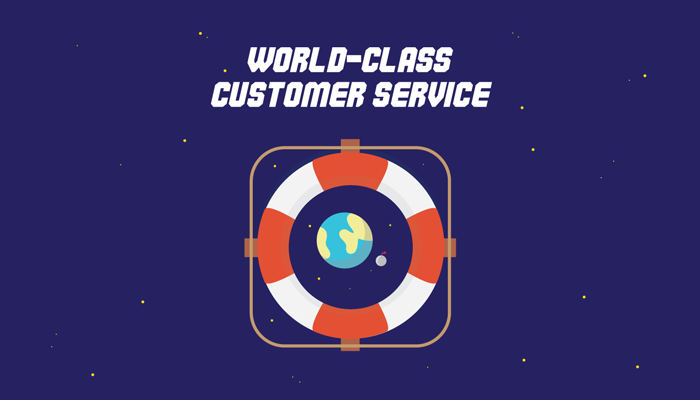 With over 1,79 billion active monthly users, which is a quarter of the population of Earth, you would need a customer service department the size of a small country to provide phone customer service, or other kinds of real-time help, to all of them. With such a huge number of users, Facebook customer service is based around two pillars: self-service through an extensive collection of articles and FAQs as well as a community forum where users help each other with the more difficult questions. Let’s take a look at both and see how they work. When you go to the Facebook customer service page, the first thing you will see is the prominent FAQ section. A section like this may be able to provide help to a large portion of your audience if you tend to get the same questions over and over. In the case of Facebook, these are things like asking how to reset a password or how to access account settings. 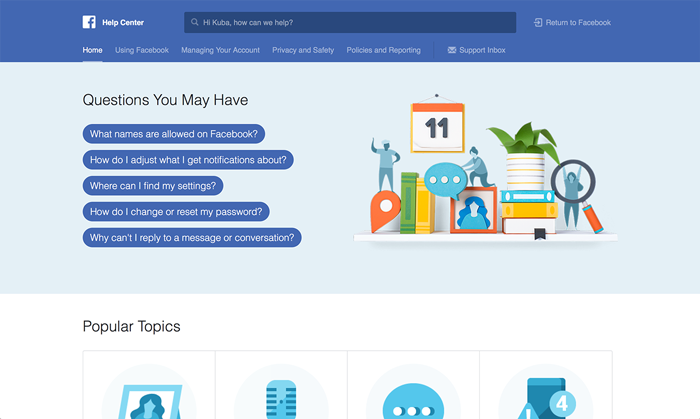 At the top of the Facebook customer service page, you can access different groups of articles through categories and a search bar if you want to find something specific. Further down the page, there’s also a list of the most popular topics. Bare in mind that everything is based around the same set of self-service articles. The idea here is to provide alternative routes to them and allow users pick the ones they like the most. If someone has a specific question that comes up all the time, the will go for the FAQ. If someone wants to explore a particular topic like Privacy, they can go for that category. If someone has a very specific and detailed question, they can give the search bar a try. Even if users reach the same materials, it’s good to leave them a choice on how they want to do that. Community forums are the other side of the Facebook customer service. On the forums, users help other users with specific matters or questions that haven’t been discussed in the knowledge base articles. The more users a business has, the easier it will be to kickstart a customer service community. With 1.79 billion users, there are thousands of people who can help others out with setting up and managing accounts or solving more difficult problems. And the best thing about the community forum is that they are practically free. All you need is a platform and a small moderation team to make sure the discussion focuses on helping and doesn’t get sidetracked. Finally, there’s a separate smaller Facebook customer service page for customers interested in buying ads on Facebook and generally using Facebook for business. You can learn how to set up an ad campaign for your products or manage your business fan page. Since the vast majority of users won’t be interested in this kind of information, it makes sense to separate it from the main knowledge base. If you were hoping that there will be some way to contact Facebook directly, I will have to disappoint you. The closest thing to real help happens when you report something or file a complaint: you get to fill out a short survey and you just might get a chance to get in touch with a Facebook customer service agent. All in all, Facebook seems to be doing fairly well with its customer service. It’s not perfect, but is anything perfect when you need to take a quarter of humanity into consideration? Real-time customer service is definitely better from the perspective of a user but it’s not really feasible. Maybe Facebook customer service should include technology like natural language processing, chatbots and AI to create an alternative to human contact? It would provide an extra way to get help without relying on self-service. Some kind of virtual assistant that would answer your questions with snippets from knowledge base articles without the involvement of a representative. It’s not the real deal, but it could probably work for some questions or topics. Let’s take a look at the ways Google deals with a huge number of customers. Before we start, we should stop and think what “Google customer service” really means. Over the years, the services provided by Google added up to this huge pile of interlinking elements. This is why the Google customer service page is divided according to different tools and services. On the page, you can find information about Google Search, Gmail, YouTube but also AdWords or Google Analytics. And the list goes on and on. Since Google handles a lot of personal and private data, there’s a section dedicated to privacy available on the page. 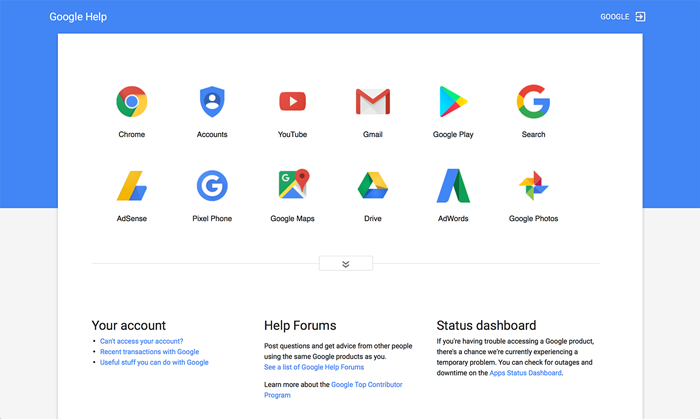 You can reach the actual help page by going to the Google Help Center, which is the knowledge base the customer service page leads to. In the Help Center, all of the services have been listed in three categories: Consumer, Business and Developer. Similar to Facebook customer service, there’s also a community forum available for the more exotic cases. There’s a lot of people not happy or even complaining about the lack of human-to-human help available in Google customer service, but considering how many services or users are involved, can we really blame them? Every now and again a question will pop up on a service like Quora asking for ways to contact Google customer service directly. However, if Google were to oblige all the request, most of the services they offer wouldn’t be free. Google works because of its scale. Most of its revenue comes from advertisers who want to have access to billions of users searching for stuff on the internet. People won’t start searching more just because they got an answer from a real customer service representative. And customer service provided by real pepole is relatively costly and doesn’t really scale. Google is in a similar situation to Facebook in terms of the number of its users. Gmail alone is pulling more than 1 billion users. Just think about it: can you name a person that hasn’t looked for something via Google Search, sent an email through Gmail or seen a funny video on YouTube? With this kind of scale, they also could look to use tools like chat bots or AI in their customer service stack to provide an alternative to human contact. What is your opinion on Facebook or Google customer service? If you are looking for an example of customer service really working at a scale, you can’t really go bigger than Facebook or Google. And if self-service works with such a high user base, it can definitely work for your company. Setting up a knowledge base isn’t that hard and doesn’t take a lot of time – definitely not in the long run. You also get a quick return on the time and resources you’ve spent to prepare for it. Once a knowledge base article is ready, it will provide help that is free forever (or at least until it goes out of date). What’s your take on the way Google and Facebook do customer service? Have you ever dealt with them and do you think this kind of customer service model works? Feel free to share your observations and experiences in the comments section. Do you like our posts? You might also like our product. Give LiveChat a go during a free, 30-day trial. LiveChat is an online chat solution for your website, social media and apps. It is used by businesses to help customers in real time, improve customer support and close more sales. or Take the product tour! Sign up and be first to know about our blog posts! Interested in publishing on our blog? Check out the requirements and have your guest entry published within several days! Content manager with quite a temper and a passion for writing. A spitfire that gets pulled into arguments easily but always has a laugh about it afterwards. When not writing, Jacob spends far too much time running, reading and watching movies. You can follow Jacob on Twitter at @JFiruta for his latest articles, reports and ebooks. Get the latest customer service and ecommerce pieces! We won’t share your email with anyone.